Veeam Agent for Linux is set up on a Linux-based physical endpoint or virtual machine whose data you want to protect. Veeam Agent for Linux Service (veeamservice) is a service responsible for managing all tasks and resources in Veeam Agent for Linux. The veeamservice component is registered as a daemon in the Linux OS upon the product installation. The service is started automatically when you start the OS, and runs in the background. Veeam Agent for Linux Job Manager (veeamjobman) is a process started by Veeam Agent for Linux Service for every backup job session. Veeam Agent that communicates with the Veeam Agent for Linux Service and Veeam Agent for Linux Job Manager. Veeam Agent is started by Veeam Agent for Linux Manager to perform data transfer operations of any kind: copy data from the backed-up volume to the backup location during backup, from the backup location to the target volume during restore, perform data compression, and so on. Veeam Agent for Linux Driver (veeamsnap) is a Veeam driver (Linux kernel module) used to create volume snapshots in the Linux OS. 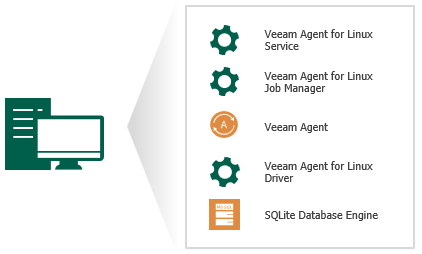 To store its configuration data, Veeam Agent for Linux uses the SQLite database engine. SQLite requires only few files to install and takes little resources to run on a Linux OS.